Spain's best-selling book of the year-an award-winning, wholly original and absorbing work of fiction by a modern master, at whose heart lies an investigation into the nature of historical truth. In the final moments of the Spanish Civil War, fifty prominent Nationalist prisoners face a firing squad. Among them is Rafael Sánchez Mazas-writer, fascist, and founder of the Spanish Falange. As the machine guns begin to fire, Sánchez Mazas escapes into the forest. When a militiaman discovers his hiding place, Sánchez Mazas faces death for the second time that day. But the unknown soldier simply turns and walks away. Sánchez Mazas becomes a national hero and ultimately a minister in Franco's first government. The soldier disappears into history. Sixty years later, as Cercas sifts through the evidence to establish what really happened, he realizes that the true hero may not be the one who was celebrated, but, rather, the soldier who chose not to shoot. Who was he? Why did he spare Sánchez Mazas? Every answer Cercas uncovers leads to another question in this powerful and elegantly constructed novel about truth, memory, and war. Javier Cercas was born in 1962. He is a novelist, short-story writer, and essayist. He has taught at the University of Illinois and since 1989 has been a lecturer at the University of Gerona in Spain. 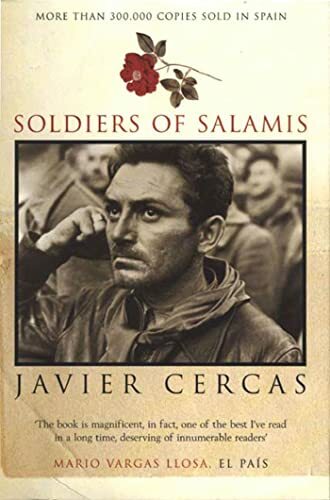 Soldiers of Salamis is his first book to be published in the United States. It has already been published in fifteen languages around the world, and the film adaptation by David Trueba debuted at Cannes in May 2003.